SNC created by Divya Pramil of You too can cook is a group of bloggers with two teams North and South. Each month a host from North team would challenge the South team and vice versa. This month Chandrani (Cuisine Delights) of North team has challenged the South team with this Paneer Jalebi and Priya Suresh (Priya's versatile recipes) of South team has challenged the North team with Chettinad Pakoda Kuzhambu. Paneer Jalebi is a Bengali sweet (or treat!!! ). It is made by soaking the deep fried paneer in cardamom flavored sugar syrup. 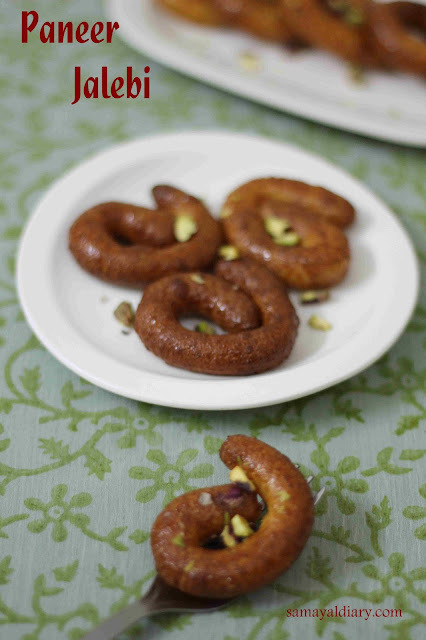 We loved it very much except for the little disappointment that I didn't get perfect shapes of Jalebis as in shops. The first time I made, I was not at all able to twist the ends of a paneer, then I realized that I didn't extract excess water completely. So I made it sit for one hour and I was able to twist well. The taste was extremely good. Thanks chandrani for this wonderful recipe. Boil Milk in a Pan. When it starts bubbling around, add vinegar in intervals. Boil till the whey separates. Remove the Paneer (Chana / Cottage Cheese) and strain the excess water using a strainer. Let this sit aside for one hour. Now add Maida, Baking Powder and Cardamom Powder to the Paneer. Mix well and knead for 15-20 minutes. Meanwhile, heat water in a Pan. When it starts bubbling well, add the sugar and the cardamom pods. Stir well and allow the sugar to dissolve in medium heat. Stir until the syrup becomes thick and sticky. Now take a small ball of the Paneer and make a thin strip of it. Twist the ends of the strip and roll to form the shape of a jalebi. If it cracks, roll with wet hands. Deep fry them and add to the sugar syrup. (Make sure the oil is neither very hot nor warm). Let this sit for few hours and serve with finely chopped pistachios. Linking the recipe to SNC of this month. 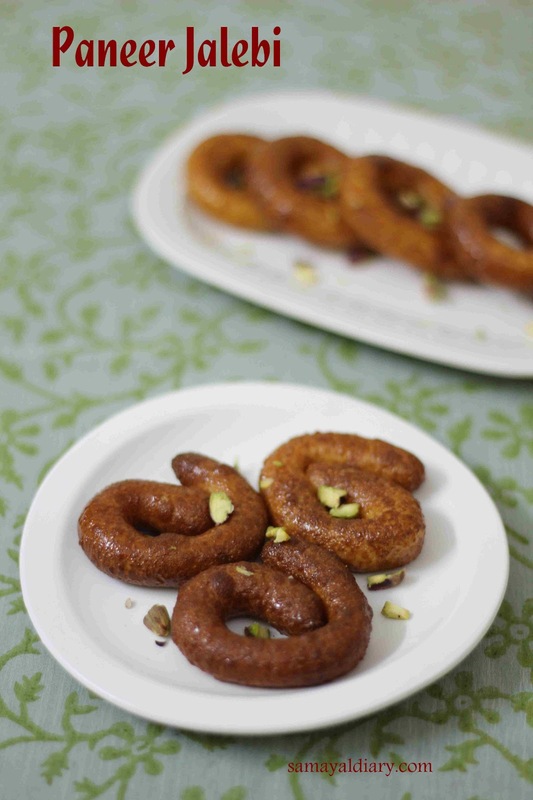 Channar jalebi looks fabulous and quite addictive. wow.. looking nice.. Soon I will try to make it out!!! How to prepare Idli Podi ? ?